Rarely do bad habits change just because somebody has brought your attention to them. Most of the time, change requires some form of vigilance, whether self-imposed or provided by others--or even better, by automation. In the case of Saint Mary's College, a women's college in Notre Dame, IN, the bad habit was paper waste. Yet by implementing a network-based printer accounting program for publicly accessible printers on campus, the college was able to decrease its paper costs alone for its four most used printers by about $1,269.. According to Kathy Hausmann, coordinator of student computing for the 1,600-student campus, over the course of the 2005-2006 school year, a single printer--a Xerox WorkCentre Pro 55--pumped out 548,260 pages. The 24-hour computer lounge in the basement of the library where that printer lives had a standing order for delivery of eight boxes of paper every week. But the people who provided support to users in that cluster noticed something: Students were oblivious to their print habits. The biggest issue, said Hausmann, was that students would print PowerPoint presentations from their instructors without checking the print settings. "They'd see that it was printing one slide per page, default, [which] they're not going to want to put in their binders. So they'd leave it in the printer, go back to their seats and print the file again." They wouldn't even bother to remove the first print job and put it in the recycle bin, she said. The primary goal of the new system was to make students aware of what they were printing. The college's CIO at the time suggested a particular print management software product, which Hausmann's group tried for about four months in test mode. In spite of vendor support, they couldn't get it to work on their network. A timely postcard arrived advertising PrintLimit Pro from GenevaLogic. The team had a demo version up and running in less than a day. From there, they tried a two-week trial in the largest computer cluster on campus--Trumper--where the Xerox machine as well as an HP Laserjet 8100TN reside. "It worked beautifully," said Hausmann. So the school bought a perpetual license covering up to 2,999 users for about $4,495 and a maintenance agreement for $899 a year and deployed it to the printers used by students. When a user sits down in front of a machine in one of the computing centers at the school, she has to log in for LDAP authentication on the network. The PrintLimit client software, installed on each computer, pops up a window announcing the student's remaining print quota. Each student is allotted $100 per year in printing--an amount that Hausmann derived by doing research among other campuses using print accounting methods and finally matching the quota offered at the large school next door, University of Notre Dame. Since the two campuses share students, it made sense, she said, to have parity. That buys 1,000 sheets--whether printed one side or both. When the student chooses to print a file, another window pops up providing information about what's being printed, what printer is being used and what the charge is for the print job. 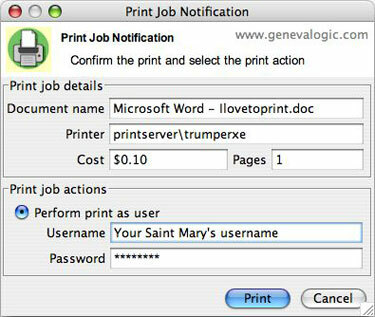 To activate the print job, the student needs to enter a user name and password again. The second authentication forces the user to confirm the information and ensures that if she forgets to log out from a computer in a public area, nobody else can print from that quota. A side effect, said Hausmann, is that students doing work for school groups, which have to pay for their printing by buying print cards, can print from that organization's quota without tapping their personal quotas. Each year, the remaining quota for each student rolls over. If a student reaches his or her limit, the student can increase it by buying a print card from the bookstore for a specific dollar amount. The PrintLimit administrator creates the cards through a wizard that generates a list of personal identification numbers, then does a mail merge to load the PINs onto the cards, which can be custom-designed. The PIN list is uploaded to the PrintLimit server. The student who buys the card enters the PIN into the PrintLimit Web site. The next time she logs in, the new quota will be reflected in the pop-up window. "We don't touch the money," said Hausmann. "We just generate the print cards [and] hand them to the bookstore, and the bookstore sells them." When Hausmann first approached her team--35 student workers--about the prospect of managing printer use, they were all for it. "They saw how much paper was being wasted every day," she said. "They are the ones refilling the printers with paper, with toner, having to remove the unclaimed print jobs from printers and putting it in a stack for scrap paper or into the recycle bin." Their support, she said, really helped communicate the importance of the change to the rest of the student body. Then a reporter picked it up as a topic for The Observer, the student paper, after witnessing the waste that went on in the Trumper cluster. Hausmann supplied statistics her student workers had compiled on printer usage. In the article students balked at the idea that IT would consider a quota system for printer usage. "I am against being charged for using the printer because many classes require us to print off lengthy articles from Blackboard and the Internet," said one student in the article. By the time PrintLimit was actually deployed, student computing had publicized its arrival through a Web page, posters, new student orientation presentations, and the two-week trial, which took place in May 2006. During that time, students received the PrintLimit pop-up window but had no limits on the quota. It would be freely replenished. Only one student came close to reaching the 1,000-page limit during the trial, recalled Hausmann. She was going to graduate school Web sites and printing out the handbooks from three different schools--and printing single-sided sheets to a two-sided printer. During the first year of deployment, Hausmann said, exactly six students exceeded their quotas and bought print cards. The cards, as a side benefit, have served as PR for the IT organization: Any time a school group needs a donation of prizes for a campus event, Hausmann creates cards to give away. A few students requested a refund of the $100 allocation, since they'd brought their own printers to campus. She had to explain that the amount was a "fuzzy number made up so you can print a thousand sheets of paper." By the end of the first year of use, the Trumper Xerox had printed 100,000 fewer sheets. The HP had a decrease of 67,000 pages. Across the four most used printers managed through PrintLimit, Hausmann calculated, the savings in year one was about 230,000 pages. "That's 47 boxes of paper we didn't have to order," she said.